Yes, it’s raining again and quite non-stop for the last two weeks and probably for the next month or so. Nothing surprising for the month of February in San Francisco, but still the view of the muggy and grey sky makes me somehow nostalgic. Growing up in the Eastern part of France one of the rainiest region in the country, I never quite understood why my parents moved from Italy where the climate was milder and sunnier to a region like Lorraine where it was grey for the major part of the year. Obviously for work but wasn’t there another city in France where the cloud was not falling on your head every day? Anytime, I get emotional of some sort, can be happy, stressed, excited, or “weather-bummed” I tend to cook, and what better to make than gnocchi to lift you up when you feel this way? probably many other things but Potato gnocchi are big part of my childhood, my mom would make those on Sundays with her special rabbit and mushroom sauce, that was absolutely divine. Then she would argue with my grandmother on what is the right way to make gnocchi, curl them or not. You can curl them with a fork or a rigagnocchi with is the little wooden board to curl them, actually when they’re curled they absorb the sauce better, if you don’t have the time, you can just leave them the way they are. I developed a few more modern versions of the traditional gnocchi incorporating more vegetables in the dough and in the dish itself. Gnocchi are mostly a winter/fall dish, they keep their warmth and are quite filling. Originally the potato gnocchi is a dish from Verona, which was created in the region in the mid 1500s and started as a typical carnevale dish. The story says that in one of the poorest area of the city, called San Zena district, as some heavy flooding created hunger and riots, Tommaso da Vico a local council, started distributing some bread, wine, butter, flour and cheese to the people on the Friday just 40 days before Easter. When he died, he left clear instructions in his will that the tradition needed to continue and that’s where the “venardi gnocolar” was born, in reference to gnocchi that started being distributed in Piazza, the city square. The tradition is still celebrated nowadays in Verona with a huge and grandiose carnevale parade. You can see the main character called “il papà del Gnoccho” (the daddy of the gnoccho), represented by an old man with a white beard who looks like Santa Clause and holds a golden fork, he rides a mule all over the city and distributes candies to kids and gnocchi to adults. 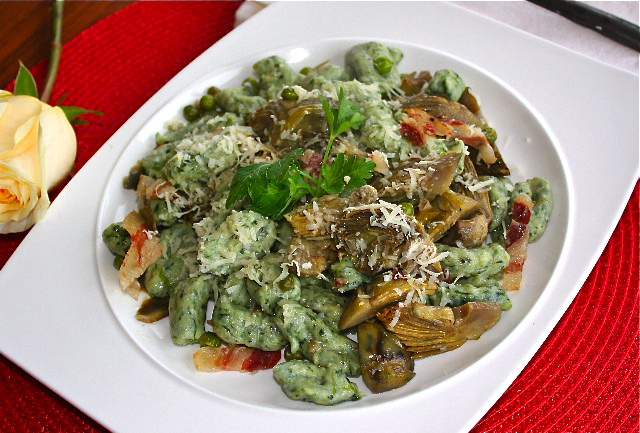 Those gnocchi are made with spinach and potatoes but you can add any colorful vegetable you want in addition to the potatoes, like carrots, pumpkin, beets, etc… for a more dramatic look and flavor. 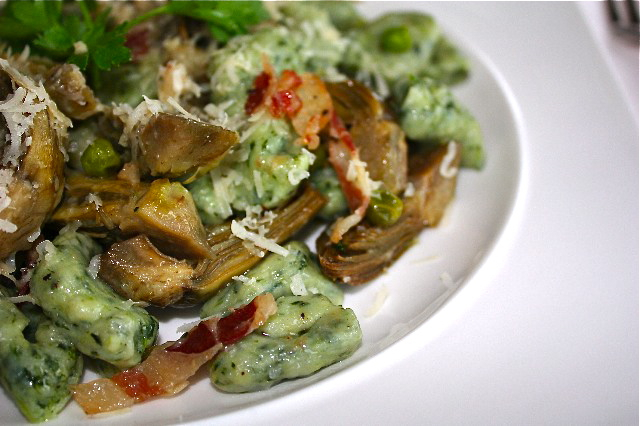 Baby artichokes are one of my favorite vegetables and adding peas and pancetta gives the gnocchi a very subtle flavor. Wash the potatoes and cook in water with peal until cooked about 30 minutes. Peel and set aside. Cook the spinach in water for 5 minutes (if fresh spinach) or defrost chopped frozen spinach in microwave. While potatoes are cooking, start trimming the artichokes. Fill a container with water and add lemon juice. Cut the artichoke stem, remove the hard leaves around the bottom of the artichoke, and trim the green part of the remaining leaves (the top part that is left) and cut the artichoke in 4 quarters. 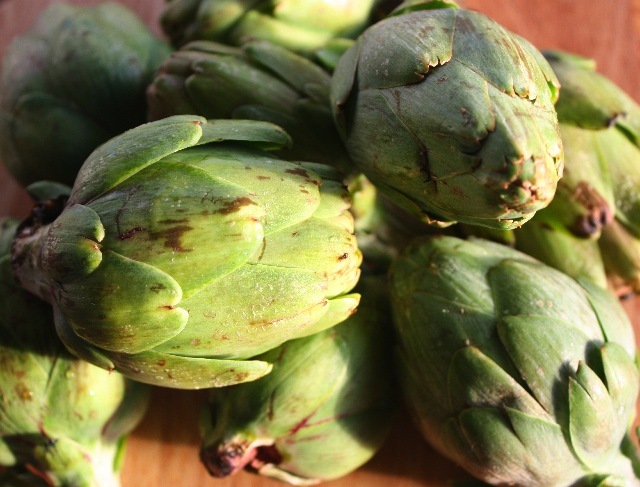 Place the artichokes in water with lemon, that will prevent them from darkening while you are in the process of cutting all your artichokes. Heat olive oil in pan, add crushed garlic, cook for one minute or until the flavor comes out, then add artichokes, stir a little, then add wine, salt and pepper. Cook for about 15 minutes or until artichokes are cooked but still firm. Remove artichokes from the pan and set aside. In the same pan, add chopped pancetta and cook until it’s nicely crunchy. Add artichokes back to the pan and add peas. Cover a cook for another 10 minutes. Add cream. When spinach are cooked and cooled down, drain water by squeezing spinach with both hands. In a large container, mash the potatoes with a potato masher and chop spinach very finely. Mix all ingredients very well until both ingredients form a homogenous mixture, then add the egg and the flour. Mix well forming a smooth dough. If the dough gets sticky, add flour. Form little cylinders by rolling some dough in a wooden cutting board and cut in 1 1/2 inch size nuggets. Add flour to ensure the gnocchi don’t stick. When water is boiling, add gnocchi to the water and cook until the gnocchi all come up on the water surface. Drain and pour gnocchi in the pan containing vegetables. Mix well and add parmigiano reggiano. This entry was posted by silvia on February 22, 2009 at 3:59 pm, and is filed under Pasta. Follow any responses to this post through RSS 2.0.You can leave a response or trackback from your own site.